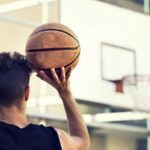 As a big fan of basketball, I’m sure, you already have known the drills to improve your basketball skills. 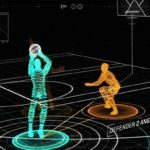 You better know the Shooting Drills, Offensive Move Drills, Rebounding Drills, Footwork Drills, Ball-Handling & Dribbling Drills, Passing Drills, Defense Drills etc. Even, you’ll get the video instructions of those drills here on Breakthrough Basketball. 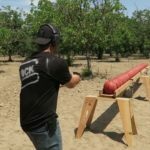 But, do you know how to improve the core strength to perform those drills in a better way? Will it be possible to dominate even a neighbouring basketball court without adequate physical strength? It seems to me that you’ve now got the point. Yes, I’m talking about Fitness Workout. 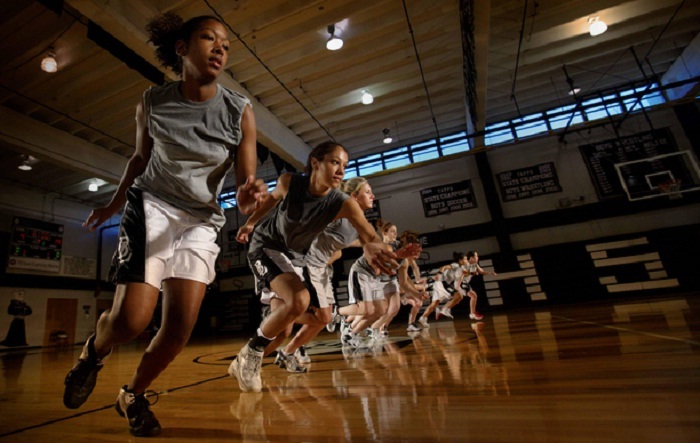 Without being physically fit, you won’t be an NBA player. So, today, I’ll try my best to show you some effective individual basketball workouts which will boost your basketball skills. Moreover, these workouts will also burn your fat to make you fit. I know, you want to dominate the basketball court. I know, you have also bought an expensive in ground basketball hoop to practice it seriously. But, the last and of course most effective part of making yourself fit to defeat the court is workout. You know, basketball players must have massive strength into their lower body. You need to jump high, you need to move fast, you need to rush forward bending your waist, so, you’ll need to build your lower body. Beside the lower part, you’ll need enough strength in your arms. Otherwise, you won’t be able to shoot your ball abruptly, frequently and accurately. So, let’s see what to do to improve our strength. With due respect to this quote, behind every great fitness there is warm up. Yap, warm up exercise is the doorway of any workout. So, first of all, we need to do warm up at least for 10 minutes. 5 minutes is okay for aimless workout. But, you are the one who have a dream of playing in the NBA. So, you have to do it for not less than 600 seconds. You can start your warm up session with a Jump Rope. Most of the NBA Coaches recommend running. But, recently it has been proven that Jump Rope is better than Running. However, 3 minutes of fast rope skipping with 3 intervals is enough. Then, you can perform high jumping, short stepping, horse running, knee down running, single leg jogging and balance jumping. You can also follow the moves shown in the following video after your Rope Skipping. Stretching is very effective to improve any type of physical performance. Stretching is a form of tranquil fitness workout in which specific tendons and muscles of your body are flexed to improve the elasticity. It increases blood circulation and also improves the range of motion. Standing Side Stretch, Standing Back Stretch, Standing Front Stretch, Runner’s Stretch, Forward Hang, Seated Back Twist, Low Lunge Arch, Neck Twist, these are some easy and common stretching moves. You know, stretching decreases the risk of injury and low back pain. Here you’ll get 6 common stretching exercises. Just after your warm up session, only 5 minutes of stretching is enough. Now, you’ve to put emphasis on the lower part of your body. As you need to jump high in playing Basketball, so, you’ve to make your legs stronger than your competitors. Do you really want to make your thighs stronger now? Okay, you’ll get a few effective workouts for your thighs right here. If you’ve completed your stretching and warm up session, then you’re now ready to do this. It is just sitting down and standing up with a barbell on your shoulders. To get the best result, keep your feet at the distance of your shoulder width, keep your chest up and keep looking at your basketball rim. If there is no basketball hoop if front of you, then at least keep looking at that same height while sitting down. You can also do this even gripping the barbell bar in front of your neck. If there is no machine in your Gym to do this, you then won’t be able to perform this workout because it is not possible to perform the Seated Leg Curl without the exact machine. However, if you have the right machine available at your gym, the following video will help you to do this properly. Important thing is that using so much weight may cause lower back injury. So, be careful. Watch the video carefully to get the idea of breathing in and breathing out. 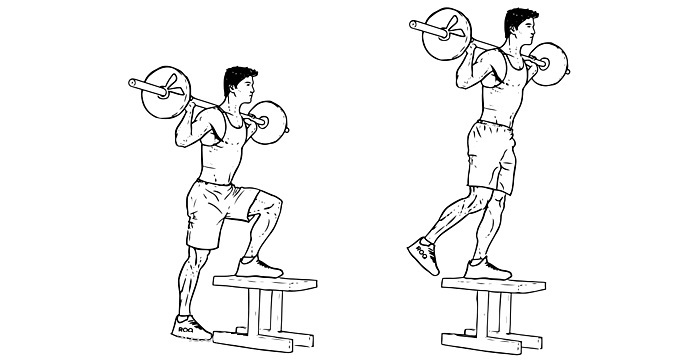 This exercise is also very helpful to improve your jumping capability. While performing the Barbell Squat, you did hold the barbell bar on your shoulders using your both arms. Now, again hold the barbell in that same way, then straighten your torso and keep your feet a little closer than your shoulder width. Now, step forward your right leg, maintain balance, keep your torso straight and squat down through your hips. Breathe in as you go down and vacate your lung while getting back to the beginning position. Now, do the same with your left leg. Here the notable point is that you shouldn’t let your knee to go onward beyond your toes whilst getting down. 20 to 25 times is enough for each leg and obviously 3 sets should be done. 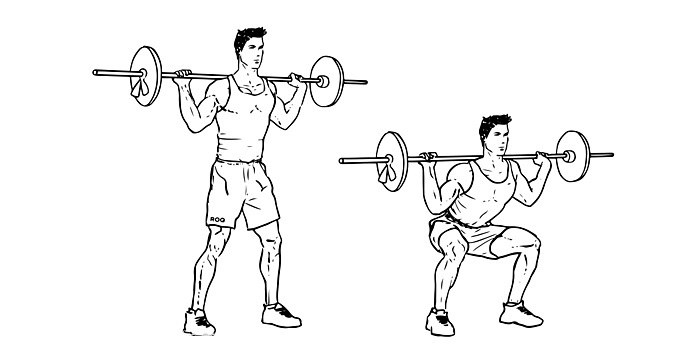 If you don’t feel comfort with Barbell Lunge, this workout then surely will satisfy you. But, both are recommended, because, you want to enjoy NBA not from the gallery, but from inside the court. Nothing so much different here. Grip the barbell as you’ve done before and stand upright behind a heavy bench or wooden seat. Now, put your right foot on the bench, maintain your balance and step up on that bench by straightening your right knee and hip. Slightly touch the bench surface with your left leg and then step down with the left leg. Right now, you’re on the beginning position. So, do the same thing with your left leg now. Repeat the move at least for 60 times within 3 sets. Instead of dozens of words, a single video will show you the exact way of doing this workout. So ,let’s start raising our calf now. Another very interesting workout for legs. Leg press machine is required and you’ll get this machine in every professional gym. You just have to sit down on the machine, put your feet on the plate in front of you at a moderate width and start doing the weight Ups and Downs with your legs. Lift the weight up until your legs completely straightened and then let the weight down until your thighs touch your belly muscles. Try to do this as fast as you can. 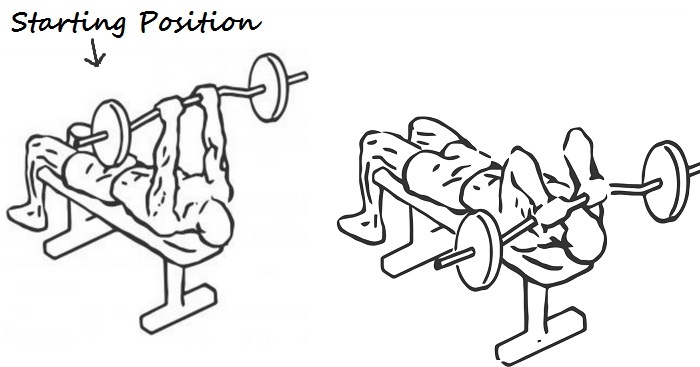 In leg press, you should use the weight 2x than your physical weight and 100 times in 4 sets will be enough. Nothing new here. You’ve done Barbell Lunge a few minutes ago. Now, in Standing Dumbbell Lunge, you have to hold two dumbbells in your two hands instead of a barbell and the rest is same just like the Barbell Lunge. Don’t lose your hands completely. It is better to keep your hands at your hips level. Watch this Dumbbell Lunges video on YouTube to be more clear. This is the finishing workout for your thighs which surely will improve your high jump limit. Didn’t you ever see a frog jumping? Frog jumps forward, but you have to jump on the same place. This is not any complicated workout. First time it may seem pranky to you but, after practicing this workout for a week, you’ll become a big fan of this workout. Only 2 minutes of Frog Jump workout will freshen up all of your muscles and also will boost your energy to do the other workouts for your upper body. If you really want to maintain your fitness and like to play in the NBA or at least wish to dominate your college basketball court, then you have to practice all the above workout at least six days a week and you can add any 7/8 workouts from the followings. So, you will need to alternate the following workouts to fulfill your routines each week. That means, if you add the first 7 exercises from the followings on Sunday, then you’ll have to add the rest 8 workouts on Monday. In this way, each will be done 3 times a week. Okay, now let’s enjoy the upper body workouts. Medium grip is suggested and a flat bench is needed. Lie down on that flat bench, lift the bar from the rack and hold it over your chest and keep your hands straight (Don’t hesitate to ask help from the other gym mates if there is no rack behind your bench). This is your beginning position. Maintain your balance and then start. Inhale enough and start bringing your hands down until the barbell slightly touches your middle chest. As soon as the barbell touches your chest, breathe out and go back to the beginning position. It is better to perform this workout under the supervision of any one of the other gym mates if you are new. Wide grip is recommended and an inclined bench is required. This is just the same thing like Barbell Bench Press, but the minor difference is that here the bench is inclined and the grip should be little more wider. This one is the supplementary workout to the Barbell Bench Press. It helps to improve the core strength of your arms which is essential in playing basketball. So, you shouldn’t underestimate this workout. This is another effective exercise to improve the core strength of your arms. It is very boring to do the same thing for hundred times. So, we like to suggest these variations to improve your arms. Use the same bench you’ve used for barbell bench press and lie down on that bench holding a dumbbell in each hand. While lying down, keep your hands on your thighs. Now, maintain your balance and lift those dumbbells up over your chest, straighten your hands and keep the dumbbells at your shoulder width distance. Now, you can easily down your hands keeping your elbows close to your body. But, you know, this is a big mistake. So, to avoid the mistake, watch the following video carefully and do this workout perfectly. Again you’ll need that flat bench and also you’ll now need an EZ bar. A straight bar also will do, but I prefer EZ bar. Select the weight carefully and put the bar behind your head on the bench. Now, keep your feet on the floor and lie down on the bench. Next to that, hold the bar which is behind your head in close grip, raise the bar over your forehead and extend your hands to the fullest. You know, this is your starting position. All you now have to do is, inhale slowly and in accordance with your breathing, bring down the weight steadily until the bar touches your forehead and then go back to your starting position. Do it 100 times in 4 sets. The important thing is that you have to try to keep your elbows unmoved and only your wrists will go up and come down to your forehead with the bar. Another workout with EZ bar and no bench is needed. Grip the EZ bar at the closest inner handle, stand up not straightly but keeping the torso straight away and keep your elbows close to your body. If I’m not wrong, now your EZ bar is below your hips level and you know, this is your starting position. Keeping your elbows unmoved, now move your forearms up to your shoulder level and then let the EZ bar go down at the starting position. Repeat it at least 25 times in one set and 4 set is recommended for better result. Here is a video instruction for you. Stand up again and this time 100% straightly. Keep your feet inside your shoulder width, pick up two dumbbells in two hands and keep your palms facing one another. Here, this is your beginning position. Now, raise your right hand to the right side and left hand to the left side. Raise both hands to your shoulder level and of course at the same time and then bring them down to the beginning position. This workout will improve your shoulders and forearms. You know, monkeys love hanging on the tree branches and basketball players do this on the goal rim. If you want to do this with your in ground basketball goal rim, you then have to do it with the pull up bar first. So, apprehend the pull up bar with your palms facing forward. This time, keep your palms outside your shoulder width. Try to keep it as wide as you can. Now, leave the ground or bench surface by bending your knee to the backward. Your torso will be 30 degrees curved to the backward and will look like a bow. Now, all you have to do is lift your front neck up to the pull up bar and then let it go down until your hands become fully straight. Do it at least 50 times in 3 sets. At first 50 times within 3 sets won’t be possible. So, you may consider maximizing your sets, but, don’t do it less than 50 times a day. Now, let’s see, what will you do tomorrow. A little earlier, you’ve known about Barbell Incline Bench Press. 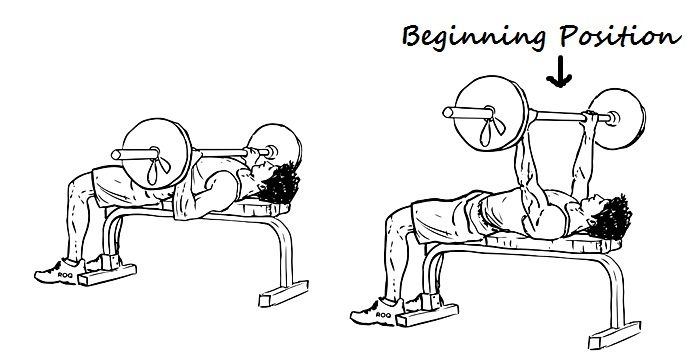 The same incline bench is needed to redact Incline Dumbbell Press and the other thing is just like the Dumbbell Bench Press. So, what are you waiting for? Lie back on your incline bench with a couple of dumbbells in your two hands and then start doing what you have done to complete Dumbbell Bench Press workout. 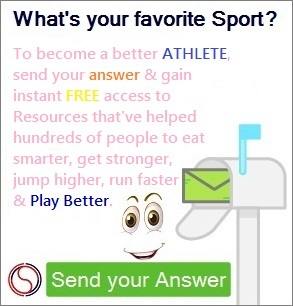 200 times in 4 sets is recommended for you, as you want to win the next NBA Cup. Dumbbell Shoulder Press is one of my favorite workouts. Though a lots of athletes do it standing straight but, you can do it sitting on a military press bench. Performing this exercise sitting on a bench is preferred because it reduces the pressure on your backbone. However, watch the following YouTube video carefully to know the perfect way of doing this weight exercise. To get control over the ball, you must have enough strength in your arms with super flexibility. This workout will make your biceps flexible enough. Nothing difficult here in this workout. Stand up with a dumbbell in each hand, extend your arms to the fullest, keep your elbows close to your body and your palms should face one another. This is your beginning point. Be careful about the fact that your elbows won’t be lifted up. You just have to lift up the dumbbells with your wrists. So, in accordance with your wrists, your forearms will also be lifted up. Lift up both the dumbbells at the same time and while lifting up the dumbbells, your palms should be rotating from inside to the outside of your shoulders. This rotation will create extra pressure on your biceps to make those muscles flexible. Now, go back to the beginning point. This is the perfect dumbbell bicep curl. Take a barbell with your comfortable weight, hold it keeping your palms inside. The distance between your two wrists shouldn’t exceed one feet and it also shouldn’t less that half feet. Now, stand up straightly. If, everything is okay and your arms are fully extended, then your barbell is now resting on the top of your thighs. You know, this is your pre starting position. Now, slightly bend your elbows and keep your torso straightway and this is the starting position. Now, lift up the bar to your chin and then lay down it to the starting point. Breathe in while lifting up and breathe out while going back to the beginning position. Do it as much as you can within 10 minutes. You may take two to three short intervals. Attache a wide bar at the top of the Lat Pulldown machine and sit down on the seat of that machine. Now, adjust the knee pad of that machine according to your height and add additional weight plates. Now, hold the bar as wide as you can and then start pulling down the bar until it slightly touches your chin. It will be better, if you let the bar to touch your upper chest. However, next to that, let the bar and your palms to go to the top. Repeat this move at least for 100 times. Being bent over for long time, bent over forwarding, these are very important skills in playing basketball. So, this workout is very effective to improve your basketball skills. Let’s see how to do this amazing workout. You’ll need two benches of the same height to perform this workout. Put a bench behind your back and place another one before you. These two benches must be placed in parallel. Now, sit on that bench which is behind you and then straighten your legs and keep your heels on that bench which is before you. Now, place your palms on the inside edge of the bench (shoulder width distance is preferred), straighten your hands and take off your hips of the bench. All of your body weight is now on your two hands. Now, slightly lunge forward, curve your legs a little and by bending the elbows let your hips go down. Keep your balance and repeat the up and down moves as much as you can in a single set. The most interesting exercise to me. I enjoy this exercise very much because I can keep my eyes on my bicep all the time while doing this workout and it inspires me to improve my muscles. A dumbbell and a flat bench or a wooden chair is needed to enjoy this exercise. Okay, okay, no more wait for Concentration Curl. Let’s see how to do it. Finally, you know basketball drills are the practices which will improve your necessary skills to throw the ball exactly through the rim. But, as you need to guard your rim, as you need to defend your opponent and of course as you want to win, so, you must be physically strong enough. The above workouts surely will improve your stamina and strength and these workouts can be more enjoyable with a pair of comfortable basketball shoes. 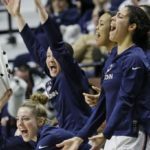 So, for the better performance, create your personal workout routine with these exercises and make yourself fit to dominate your desired basketball court.